In this image from video released by the CIA, Hamza bin Laden is seen at his wedding. The U.S. government is offering a reward of $1 million for information leading to his location. The government says Hamza bin Laden "is emerging as a leader" of al-Qaida, posting videos on the Internet calling for attacks on the U.S. and its western allies. He is particularly interested in exacting "revenge" against the U.S. for its 2011 killing of his father, the State Department says. The U.S. added the young bin Laden to its terror blacklist in 2017 and froze his assets in the U.S., finding that he was "actively engaged in terrorism." Hours after the State Department's reward offer, Saudi Arabia's interior ministry announced that it was stripping Hamza bin Laden of his citizenship, Reuters reports. 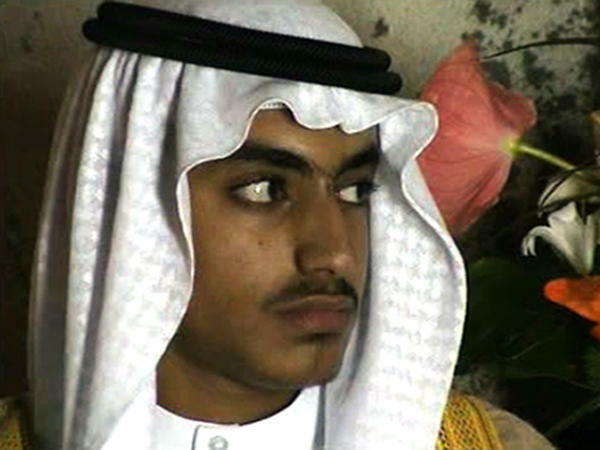 According to the State Department, Hamza bin Laden is in his early thirties and married to the daughter of Mohammed Atta, the lead hijacker in the Sept. 11 terror attacks against the World Trade Center. Letters seized from Osama bin Laden's compound in Abbottabad, Pakistan, "indicate that he was grooming Hamza to replace him as leader of al-Qa'ida," the State Department said. "He could be anywhere," said Michael Evanoff, an assistant secretary for diplomatic security at the State Department, according to USA Today. Evanoff said Hamza bin Laden is likely hiding somewhere around the border between Pakistan and Afghanistan. On Thursday, the United Nations Security Counsel added Hamza bin Laden to its sanctions list. That means he's subject to an assets freeze and travel ban. Hamza "has called for followers of Al-Qaida to commit terror attacks" and "is seen as the most probable successor of [Ayman] al-Zawahiri," the U.N. said. Al-Zawahiri became the leader of al-Qaida after the death of Osama bin Laden.